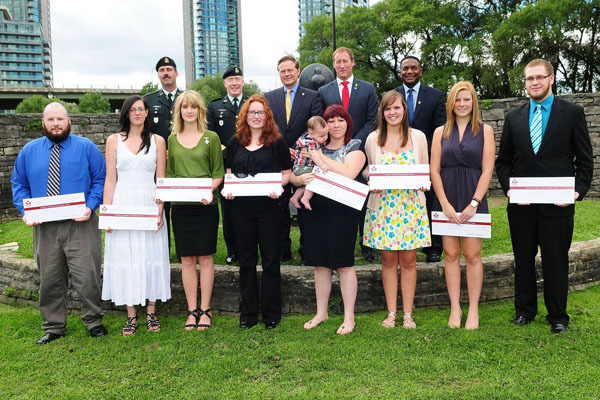 Blake C. Goldring, Chairman of Canada Company and Chairman and Chief Executive Officer of AGF Management Limited (back row, centre) was joined by The Honourable Peter MacKay, Minister of National Defence, Councillor Michael Thompson, City of Toronto, and Lieutenant-General Peter Devlin, Commander of the Canadian Army, to present eight children of Canadian military personnel who perished while serving their country with post-secondary education scholarships from Canada Company at the fifth annual awards ceremony Friday at Historic Fort York in Toronto. 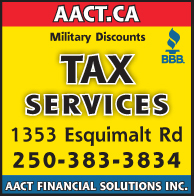 When members of the Canadian Forces are killed in the line of duty, the surviving loved ones may worry about how they will continue to provide for the fallen member’s children, especially when it comes to financing their post-secondary education. Thanks to a scholarship specifically for children of fallen CF members, called the Canada Company Scholarship Fund, attaining a post-secondary education is within reach. The Canada Company scholarship provides $4,000 per year, for up to four years, to support the post-secondary education for children who qualify. Children of Canadian Forces members who have died on duty while serving in an active role on a Canadian Forces mission, whether a member of the Regular Force or Reserve Force, since January 2002 are eligible to apply. The Canada Company Scholarship Fund will provide scholarship grants to children dating back to Jan. 1, 2002. Managing director Peter Hart says the scholarship is open to children of all Canadian Forces members. The deadline to apply for the Canada Company scholarship is ongoing. 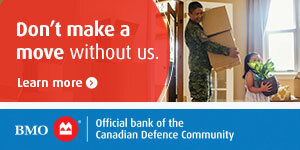 To learn more about the scholarships and how to apply, visit www.canada company.ca. Canada Company scholarships have received leadership funding in the amount of $1 million from CIBC. Additional financial support was secured from Paul Desmarais, Jr., Power Corporation; Peter Munk, founder and chairman of Barrick Gold Corporation; Jim Balsillie, RBH Inc.; The W. Garfield Weston Foundation; The TD Bank Financial Group, BMO Financial Group; Scotiabank; Standard Life; Laurentian Bank of Canada / B2B Bank (formerly B2B Trust) and AGF Management Limited. Canada Company is calling on other members of the corporate community to contribute to this initiative.